Marked by vintage style with modern technology, Sign of the Crab has been a world-famous manufacturer of beautiful bathroom fixtures since 1972. Chicago Faucet Shoppe is a longtime fan of Sign of the Crab, and we’re thrilled to offer our loyal customers an extensive selection of its top-quality products. In our selection, you’ll find everything from Sign of the Crab faucet parts to Sign of the Crab clawfoot bathtubs and shower enclosures. Each item is touched with the signature metal accents that Sign of the Crab is known for. Add one of these items to your bathroom to immediately elevate your space. Chicago Faucet Shoppe cares about keeping your plumbing hardware in tip-top shape, which is why we also offer every Sign of the Crab replacement part for whatever issue you may run into. With ChicagoFaucetShoppe.com, repairing your bathroom fixtures has never been easier, faster or cheaper. Browse our selection and choose the item that will bring your bathroom to the next level. With Sign of the Crab, whatever you choose is sure to be a beautiful addition to your home. Strom Plumbing Clawfoot Bath Tubs are made of either solid cast iron or fibre-glass. We have the complete selection of Strom bathtubs for your traditional style bathroom. Strom Plumbing Clawfoot Tub Faucets are true traditional reproduction fixtures for vintage style bathrooms. These leg tub faucets from Sign of the Crab come backed with a lifetime warranty and ship fast to you. Save up to 40% on select models. Full line of Clawfoot Leg Tub Shower Enclosures by Strom Plumbing - Sign of The Crab. Shop for Complete tub on legs shower systems with hand shower and curtain rod. Strom Plumbing Kitchen and Bathroom Faucets are vintage reproductions that compliment any traditional setting. Find porcelain and brass bridge style kitchen faucets, widespread lavatory faucets and more. 1-3/8-inch Clawfoot Tub Drain Assemblies by Strom Plumbing (Sign of the Crab) work with just about every tub on legs ever. Clawfoot Leg-Tub Supplies by Strom Plumbing are polished for finished look when exposed. Supply any tub on legs faucet with these copper tubes and shut-off valves from Sign of the Crab. Strom Plumbling - PP0245C - Hot and Cold Chrome Cartridges. Please Note: Sold as a Pair. 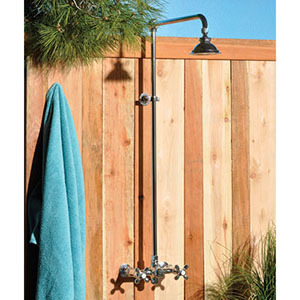 Strom Plumbing - P1123C - Chrome outdoor shower unit. 7" center wall mount faucet w/1/2" ips female connection, 36" riser & 16" shower arm. Faucet bottom cap is removable to drain faucet for winterization.